Hakuakai Karate – What Do the Karate Belt Colors Mean? Hakuakai Karate / Uncategorized / What Do the Karate Belt Colors Mean? 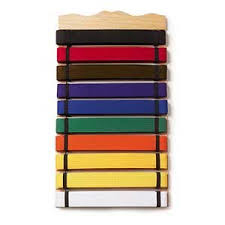 Awarding various colored belts to signify the achievement of new levels of expertise in karate and is a relatively recent tradition. The colored belt is said to have been created by Jigoro Kano, the founder of judo, in 1888.The practice was then adapted into other martial arts, including karate. Earning a belt not only indicates an advancement of rank, but an advancement of personal growth. Not every karate school uses all the colors, and the order of the colors may vary slightly. Belt colors can also be interpreted in more than one way. White and yellow belts signify that a student is a beginner. White symbolizes the innocence of a new student that embarks on his journey with no prior knowledge. A yellow belt symbolizes a seedling being adorned by the sun’s rays; and also the student opening his mind and allowing the wisdom of his sensai to penetrate his consciousness.